A growing body of research suggests that inflammation plays a role in many chemotherapy-related toxicities such as fatigue, anxiety, and neuropathy. Regular exercise can change levels of individual cytokines (e.g., reducing IL-6, increasing IL-10); however, it is not known whether exercise during chemotherapy affects relationships between cytokines (i.e., whether cytokine concentrations change collectively vs. independently). This study assessed how 6 weeks of exercise during chemotherapy affected relationships between changes in concentrations of several cytokines. 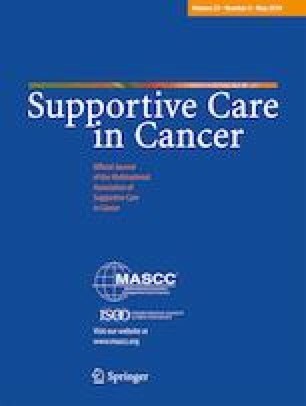 This is a secondary analysis of a randomized trial studying 6 weeks of moderate-intensity walking and resistance exercise during chemotherapy compared with chemotherapy alone. At pre- and post-intervention, patients provided blood to assess serum concentrations of cytokines IL-1β, IL-6, IL-8, IL-10, and IFN-γ, and receptor sTNFR1. We investigated relationships between cytokines using the correlations between changes in cytokine concentrations from pre- to post-intervention. We obtained complete data from 293 patients (149 randomized to exercise). Exercise strengthened the correlation between concentration changes of IL-10 and IL-6 (r = 0.44 in exercisers vs. 0.11 in controls; p = 0.001). We observed the same pattern for IL-10:IL-1β and IL-10:sTNFR1. Exercise also induced an anti-inflammatory cytokine profile, per reductions in pro-inflammatory IFN-γ (p = 0.044) and perhaps IL-1β (p = 0.099, trend-level significance). Our hypothesis-generating work suggests that regular exercise during 6 weeks of chemotherapy may cause certain cytokine concentrations to change collectively (not independently). This work enhances our understanding of relationships between cytokines and complements traditional analyses of cytokines in isolation. Future work should test for replication and relationships to patient outcomes. Clinical Trials.gov, # NCT00924651, http://www.clinicaltrials.gov. The authors would like to thank Drs. Susan Rosenthal and Amber Kleckner for reviewing this manuscript. We extend special thanks to the patients who participated in this study, as well as the research staff of the University of Rochester Cancer Center NCORP Research Base at each of the NCORP affiliates who recruited and followed participants in this study. We also thank the staff of the PEAK Human Performance Laboratory and the Cancer Control Psychoneuroimmunology Laboratory, especially Ms. Ann Colasurdo for conducting the cytokine assays. We thank the National Cancer Institute for their funding support of this project. Funding was provided by the National Cancer Institute, including K07CA221931 to I.R.K. and funds from NCORP (formerly CCOP) parent grant UG1CA189961, NCORP (formerly CCOP) supplement UG1CA189961, and R25 CA102618. Each institutional review board approved the study before participants were enrolled. All participants provided written informed consent.